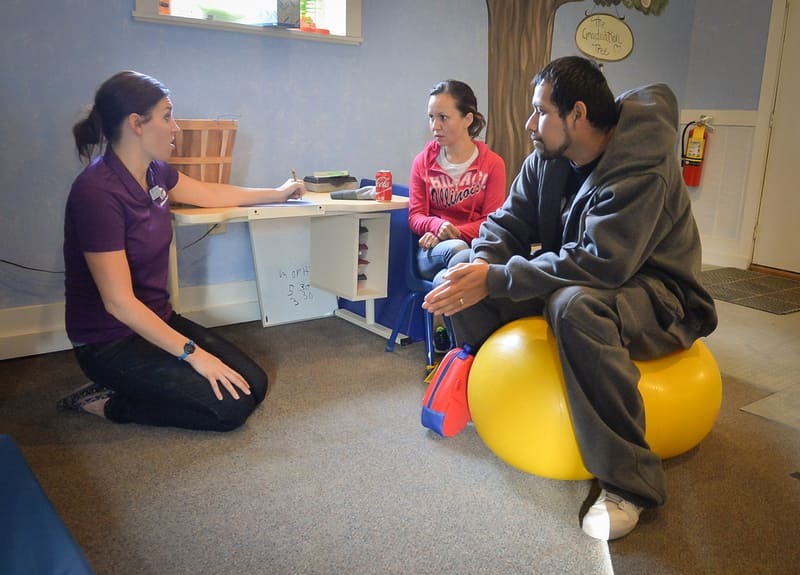 Juan called his wife Monica from the Children’s TherAplay waiting room a couple of weeks ago with exciting news: Jonah had said Hi to two strangers, unprompted. Monica’s heart soared. There was hope. At age five their son Jonah seemed to be somewhat aware of the world around him but was only distantly engaged. He had no interest in others – “I never saw him looking at people,” Monica reports – and, even when someone addressed him directly, he still seemed far away. But now, with four months of occupational therapy at Children’s TherAplay, that was changing. “Now if someone’s talking to him, he’s paying attention to them. He’s more aware.” And, to Monica and Juan’s delight, he was not only responding to people but, for the first time, initiating contact. Ask anyone who has experience with autism spectrum disorders and they’ll tell you that’s huge. Monica explains, “Before [beginning treatment at Children’s TherAplay] he didn’t want to be around other children. He ignored the kids everywhere. Now with his cousins he wants to be with them. When they run, he runs with them. When they sit, he sits with them. … He wants to be more social.” For the first time in his life, their son was engaging with the world around him. And now, as Juan had witnessed in the waiting room, that engagement was growing. Awareness: Even when responding to people, Jonah seemed far away. Eye contact: When directed, would glance at someone out of the side of his eyes. Interaction with others: Extremely limited interest in other people. Chose to play or be by himself. Following instructions: Even though Jonah understood requests like “Bring me the juice,” he was unable to connect the words with the actions and seemed a little lost. Touch: Difficulty tolerating light touch, e.g. : patting his therapy horse. Reaction to food: Screamed and cried when food was brought out. Eating: Extremely limited diet of individual (not mixed together) beige-colored foods. Required a great deal of coaxing or spoon-feeding. Awareness: Jonah is much more present to and connected with the world around him. Eye contact: Greets Miss Arin with full eye contact and a big smile. Interaction with others: Wants to be social! Runs and plays with his cousins! Initiates interactions! Following instructions: Now when his mother says “Bring me the juice,” he can make the connection between the words and actions and is happy to complete the task. Touch: Enjoys giving his therapy horse a gentle pat and saying thank-you at the end of the on-the-horse portion of this treatment. Food: Sees food as fun. Willing to play with it – dip one food in another, kiss a goldfish cracker – and has greatly increased tolerance in eating it. Eating: Has added two more items to his diet and is working on a new color (orange!). Branching out into eating foods mixed tougher. Enjoys picnics. 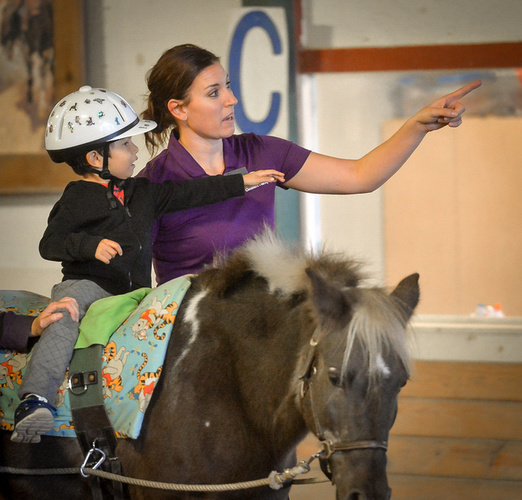 When she read about hippotherapy – treatment integrating the movement of horses – something clicked – “I wanted to try.” Her search paid off. Like many children with autism, Jonah’s sensory challenges make it difficult to tolerate food. Occupational therapist Arin recalls, “During our first treatments together, I would bring food out and he would scream and cry.” There was a huge amount of resistance but Arin knew what was possible. “I wanted food to be fun for Jonah.” So she tried a different approach. Then she introduced picnics in the sensory room treehouse, which delighted Jonah. To help generalize eating, she asked Jonah’s parents to pack his lunchbox at home. “Now he sees his food being prepared at home and he sees it here.” Jonah is making the connection that he can eat food different places. And yes it can be fun, even if those sensory challenges are telling Jonah that food should be only one color and never, ever touch. “We’re introducing the color orange. So, during our picnic, we ‘feed’ orange carrots to the stuffed animals and we give orange goldfish crackers a kiss.” Juan was astonished to see his son eat a Dorito at home without any prompting. Perhaps not surprisingly, as Jonah has become more aware of and engaged in the world, some things that didn’t register before are now making themselves known: an intolerance for certain noises, for example. “That makes it difficult for us to go some places like restaurants because he doesn’t like the sound of the silverware,” says his mother. Tears come and she chokes up when she talks about the people who make this treatment possible. “I just want to say thank you. They don’t have to do it,” but they do so children like Jonah can spread their wings. Given all the progress her son has made in just four months, Monica is convinced her son will soar. 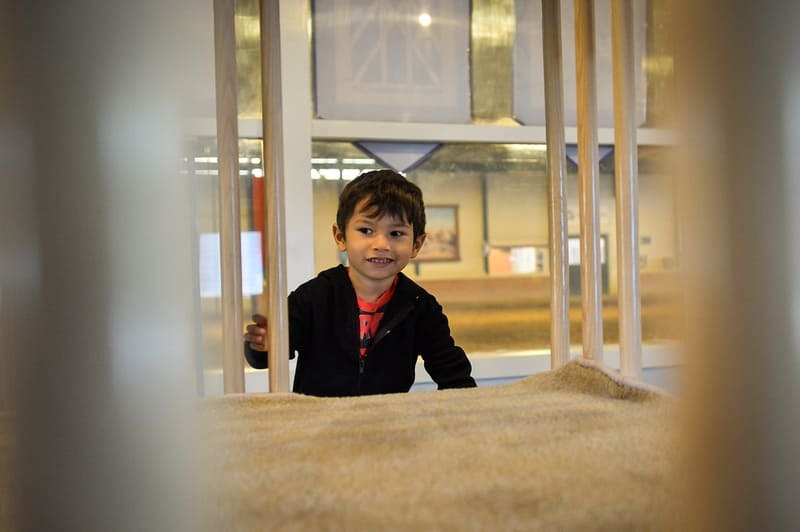 Although his language is extremely limited right now, “I feel like if he keeps going [for treatment at Children’s TherAplay], one day I think he’s going to be able to talk. He’s not there yet, [but] he’s getting there.” Yes he is. Giving Jonah that sensory input [from the horse] helps him feel calm enough to focus and be willing to try [new foods and textures].